It's been a while since I've shared a rolled pizza. 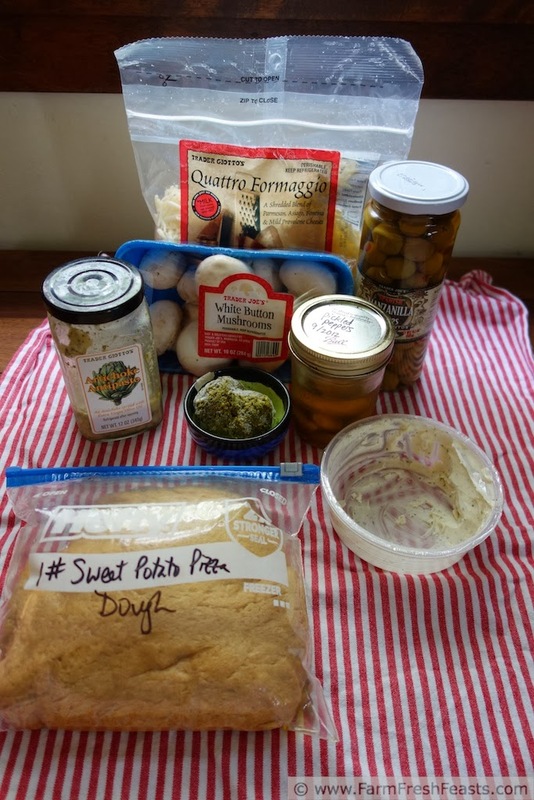 I started with a Basic FarmFreshFeasts-a-boli, then later a Beef and Mushroom FFF-a-boli. 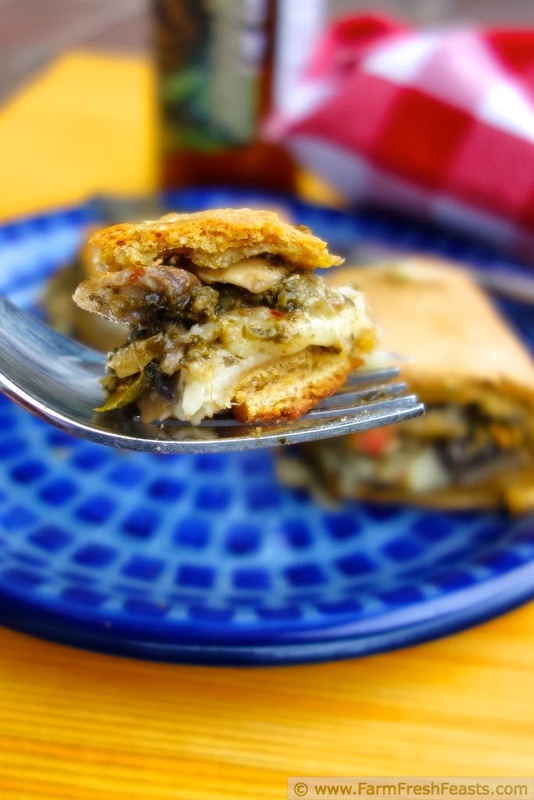 Coming next Friday I'll have a tasty turkey 'boli using Thanksgiving leftovers. But today, I am all about the vegetables. 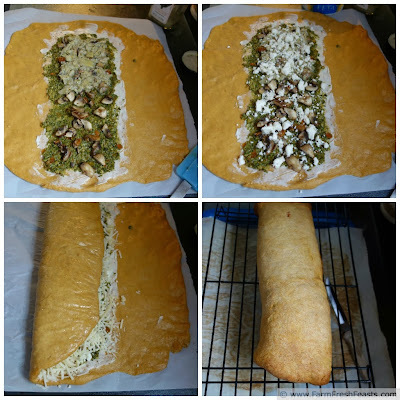 The base of this rolled pizza is a Roasted Sweet Potato crust I shared here. [Can you tell that I make multiple batches of dough in one go, so I can play around with the toppings?] Since I usually have an antipasti bar going on in my refrigerator door I grabbed a bunch of jars for pizza topping ideas. I put back the grape jelly, peach jam, sriracha and lemongrass but kept the stuff you see below. Starting with a base of sautéed mushrooms, I added some pickled peppers, then olives and artichoke hearts, with pesto to tie the whole thing together. Three cheeses make this extra gooey and yummy. If you eat turkey for Thanksgiving, but will be serving vegetarians in your post-Thanksgiving Eat All The Leftovers period, keep this pizza in mind. For general pizza-making hints, tips, musings and photo collages, please see my Pizza Primer post. For step-by-step photos walking you through how to rock and roll with your pizza dough, please see my Basic FFF-a-boli post. If you've got a pizza stone, now's the time to put it into your oven. If you don't, a cookie sheet will substitute. Preheat the oven to 400 degrees Fahrenheit, and a small skillet over medium heat. Add a splash of oil, and sauté the mushrooms 5-10 minutes until they give up their liquid. Season with salt and pepper, set aside. On an oiled piece of parchment paper, stretch out the dough into a rectangle, perhaps 10 inches by 15 inches but don't hold me to that. If you've got an offset spatula (use a craft store coupon to get yours if you don't have one, it's cheaper that way) spread the cream cheese across the middle third of the dough as shown. Spread pesto on top, then artichoke antipasto or artichokes. [If it looks like my artichokes only went halfway over the pesto, that's correct. I was iffy about the topping and decided to try half with and half without. The half with tasted better, so I wrote up the recipe to reflect that.] Top with mushrooms, peppers, olives, and cheeses. Pick up the parchment paper to gently flop one side of uncovered dough over the center. Repeat with the other side. [Honestly, I'm not in cahoots with the parchment paper companies, it's just so much easier to have a great result when I use parchment paper and I want to set you up for success.] Pinch the dough seam closed. Flip the pizza over, so the seam side is down, and transfer the parchment paper and pizza into the oven. Bake for 30 minutes, until dough is browned. Remove from oven and cool on a rack a few minutes. Slice (I use a serrated knife for this) and serve. I have not tried a stromboli, though we have done individual calzones. I think stromboli is in our future here. Thanks! You're welcome. Since I'm used to making 2 or 3 pizzas on a Friday night I don't like the long cooking time of the rolled pizzas, but if I'm only making one it's not so bad. I'm working on focaccia as a base for a pizza topping bar right now, and you've just given me the idea to make personal focaccia. Wow. I thought the chicken cranberry balls were creative. This tops that, and makes my veggie loving heart skip with delight. By the way, I love the first picture with the forkful of food. You got me right then and there. I'll have you know that it was even my hand holding said fork, which makes the fact that I could get something in the photo in focus all the more impressive to me. I'm glad to make your heart skip, though you may wish to consult a doctor if it happens frequently because your lower heart chambers need time to adequately fill with blood before pumping out to the rest of your body I'll just stop now. 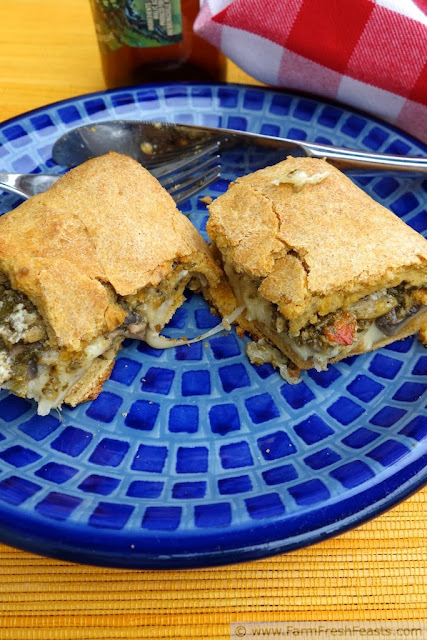 This is beautiful, and totally reminding me that stromboli is on my to-make-soon list. Thanks! This is just beautiful...not only does rolled pizza sound AMAZING, but all the individuals components sound so fresh and wholesome. A clear win! Thank you for sharing with me! I'm all about the fresh, though not always about the wholesome ;) thanks for stopping by! This looks like a perfect dish for a party. If only I were as organized as you are about making and freezing pizza dough. I don't know if Im organized or ambitious or lazy (easier to double or triple a recipe and have extra dough than to remember to make dough). But you're right, it presents very well.